These are our annual Awards given for art works we received in the year 1st January to 31st December 2017. Each year we make two Awards, one for a Series of art works and one for an individual art work. We wish we were able to make several Awards - many of the artists here made work that is deserving of an Award. If you look through our main Gallery you will see art works from many countries, including : Australia, Belgium, China, Croatia, Democratic Republic of Congo, Denmark, England, Germany, Greece, India, Ireland, Italy, Latvia, Madagascar, Mexico, Netherlands, Nigeria, Northern Ireland, Romania, Russia, Rwanda, Scotland, Slovenia, South Korea, Spain, Sweden, Ukraine and USA. This list is steadily increasing. Both of the Winning works this year have impressed large audiences across many countries, in the arts and across the wider public. We congratulate the two Winners and all the artists whose work was 'Highly Commended' (see below). In today’s world there is an important role for art with a conscience. These art works are great examples of that and we are very pleased to show them to our global audience. The Winner of our annual Award for a Series of art works is Hans Overvliet from the Netherlands for his series ‘Distant Suffering’. ‘Distant Suffering’ is a large and ongoing series of work (started in 2013) that investigates the role of the media in the representation of military violence and memory. In this series Hans also questions the role of the media consumer, and his own role as an artist. In thematic terms Distant Suffering is a growing series of art works about art, violence, war and destruction as presented in media production, media consumption, fading remembrance / memory, the politics of aesthetics, and ownership of the actual events versus their documentation. Many connections are made within each of the works and between them, so there is a strong overall coherence to the 'Distant Suffering' series. Hans integrates into his works many existing media images and combines them with other elements and materials. This allows us to view these images and the themes through a very different lens. 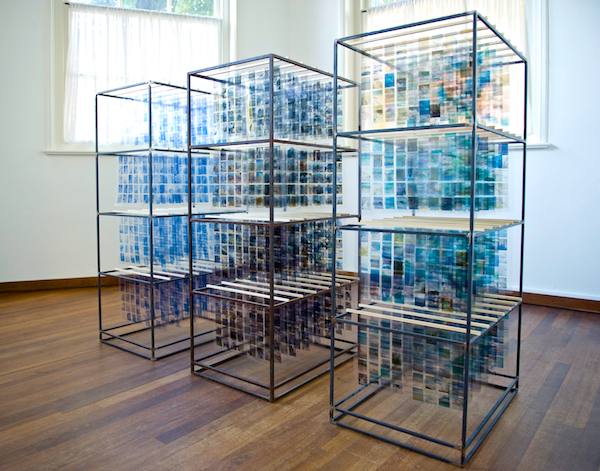 Often, his intended themes include the multiplicity and variety of visual culture - and its mindless consumption. 'Distant Suffering' asks the spectator to gaze intently at the work, to investigate it, in order to instigate in the viewer a deeper awareness of the images and connections which surround us in our daily lives. Many of us, if we live in so-called ‘developed’ countries, have governments who have contributed (and are still contributing) to widespread suffering in places like Syria, Yemen, Afghanistan, Iraq, Palestine - indeed in most of the world’s conflict areas. 'Distant Suffering’ draws those of us who live in such 'developed countries' to reflect on the troubled parts of the world. Hans' work undermines any sense we might have that we are neutral, morally innocent or ‘distant’, or free from any responsibility for the vast suffering in these places. Other works in the 'Distant Suffering' series such as ‘Anatomy of a Cloud’ and ‘Syrian Skies’ are good examples of this. So, as producers or consumers of art, 'Distant Suffering' reminds us that some of our societies are implicated and complicit. We may wish to be entirely neutral and distant viewers but we may not be. Perhaps the most powerful art keeps us more actively alive to life’s full realities and ensures that we face up to our full humanity. In today’s highly interconnected but problematic world this is a vital role for art. You can see more of 'Distant Suffering' and some of the different works within it in our Main Gallery here. The Winner of our annual Award for an Individual piece of art is Naam (Tasos Nyfadopoulos) from Greece for his work ‘Crisis' . This large sculpture called ‘Crisis’ has been reviewed and discussed by the press and media around the world. 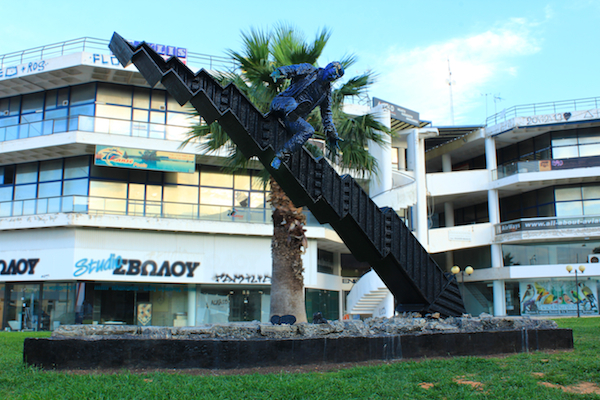 Tasos’ sculpture publicly confronts the harsh realities imposed on the Greek people since the extreme financial crisis of 2007-8. Tasos was working for 18 months on this large-scale, public installation, inspired by the problems caused by the global financial breakdown. It is thought to be the first large sculpture in a public place addressing the socioeconomic consequences of the financial crisis worldwide. The innovative materials include carbon fibre, fibreglass, iron, cement, epoxy resin and 24 carat gold (on the man’s skin). The sculpture is 6.8 metres long, 3.4 metres wide and 3.8 metres high. It is located in the municipality of Hellinikon-Argyroupolis, at 602 Vouliagmenis Avenue in Athens, the Capital city of Greece. The sculpture is of a financial graph sloping downwards into the ground and a man falling, with the man’s despair vividly portrayed. In 'Crisis' Tasos has captured the collective memory and anguished cry of Greek society against the crisis. The sculpture portrays a strong symbol of the impact of the crisis on society and people. Its main objective is to present, in the most vivid manner, the consequences of the crisis, focusing mainly on people’s comprehensive suffering. Statistical data, graphs, percentages or numbers alone are inadequate abstractions for depicting people’s suffering and frustration. You can see more of Tasos’ work in our Main Gallery here.